Countdown: The 10 Best Simpsons Episodes! Thirty effing years. That’s insane. The Simpsons has become such a faded and well-worn thread in our cultural tapestry that it’s easy to forget how important it is. You could make the case, and many have, that it has featured the most consistently excellent writing in the history of series television. And of course, any discussion of the show brings instant debate, from hipster-inspired cries of long-lost relevance to the nearly impossible attempt to rank the best episodes. Homer joins the voice cast of Itchy & Scratchy, and what follows is not only hilarious, but a spot-on skewering of media pandering. Monty Burns assembles a star-studded group of Major Leaguers for the company softball team. Extra points for Terry Cashman re-recording his “Talkin’ Baseball” to memorable effect. A new wonder drug gives Homer a full head of hair and he begins to climb the corporate ladder, with a big help from his new secretary Karl (a terrific Harvey Fierstein). The Simpsons take on Kubrick’s classic horror film and the results are perfect, right down to the picture of the tartan-clad lass hanging above Groundskeeper Willie’s bed. When Bart and Lisa are away at Kamp Krusty, Homer and Marge are enjoying an ideal life..until Kent Brockman’s special report clues them into the erupting camper rebellion . After the TV show Police Cops uses the name “Homer Simpson” for a fat, stupid detective, Homer changes his name. Taking inspiration from a hair dryer, he becomes to “Max Power” and begins getting new-found respect…so much so that he changes Marge’s name to “Hootie McBoob.” Classic. 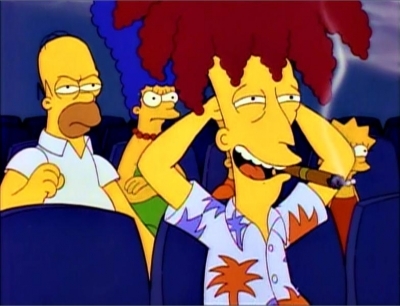 A triumphant return for Sideshow Bob (Kelsey Grammar), as he resumes his quest to kill Bart. The Simpsons enter the witness protection program as “The Thompsons,” and a flawless parody of Cape Fear takes shape. Bart and Lisa discover Mr. Burns’ plan to use the fur from a litter of Greyhound puppies for his wardrobe, which leads to Burns singing “See My Vest,” one of the nest songs in the entire series. Reflecting the country music boom that was exploding at the time, Homer becomes the manager to struggling country singer Lurleen Lumpkin (Beverly D’Angelo). An endlessly quoteable (and singable) episode. A satire of the Bigfoot TV specials of the time, this episode isn’t one of the best, but it contains one of our favorite segments ever seen on the show: Albert Brooks as Bob the RV salesman. Okay, we’re going to stop now before our top 10 list becomes a top 50…which episodes did we miss?